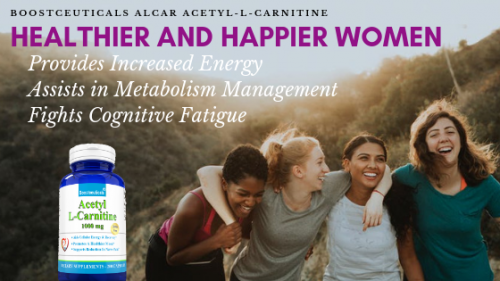 Boostceuticals joins the International Celebration of Women’s Month 2019 - to empower women in all settings, rural and urban with their all natural, physical & mental energy boosting ALCAR - Acetyl-L-Carnitine supplement. New York NY, United States - February 26, 2019 /MarketersMedia/ — March is set aside to honor women’s contributions in American history. The following statement made by President Jimmy Carter establishes the National Women's History Week ‘From the first settlers who came to our shores, from the first American Indian families who befriended them, men and women have worked together to build this Nation. Too often, the women were unsung and sometimes their contributions went unnoticed. But the achievements, leadership, courage, strength, and love of the women who built America was as vital as that of the men whose names we know so well.’ This proclamation followed by numerous events surrounding International Women's Month on March. Although the role of women has changed dramatically over the past few decades, one thing has remained unchanged: the continued pursuit for work balance as women engage in multiple roles simultaneously, or a “doing it all” attitude. Women have made progress on societal issues including economics and leadership. Moreover, women have made progress on health issues, which impact women’s personal well-being, as well as their economic security. In this generation, coverage of women’s health issues have gone beyond the perinatal phase, it now involves meeting the day-to-day needs of a woman who aims to fulfill and balance her multiple roles. Women are more aware of their need to take care of their bodies and consider the best vitamins for their health needs. Many have discovered that the key to fulfill their multiple roles is taking the right supplements and addressing all their dietary needs. With ALCAR, Boostceuticals aims to assist women in fulfilling their roles with the right physical energy, fighting mental fatigue and staying healthy in a natural way to achieve their goals. Boostceuticals ALCAR - Acetly-L-Carnitine boosts women’s physical energy and brain power. As an anti-aging nootropic, Boostceuticals ALCAR-Acetly-L-Carnitine helps the brain perform better. Studies have shown that it can improve one’s mood, learning, and memory. With these benefits, women of different ages can stay alert in their job whether as stay-at-home-mom or climbing the career ladder. Boostceuticals ALCAR also provides energy by burning fats. Acetyl-L-carnitine helps the body to more effectively use fat as its preferred energy source. Supplementing with Boostceuticals ALCAR allows fatty acids to be more readily oxidized and metabolized, providing the fuel the body burns upon movement. The highest quality daily dose l carnitine provides individuals with a premium Acetyl L Carnitine supplement for best results without any side effects. In addition, one of the biggest challenges is keeping weight under control and also getting rid of belly fat. This challenge is not just cosmetic. Excess body fat has serious consequences for health. A high waist-to-hip ratio foretells a greater risk of heart disease, stroke, diabetes, metabolic syndrome and even certain cancers. Many have even diligently pursued strength training and adding healthy dinner ideas into their weekly repertoire. Despite this effort some still struggle to lose belly fat. Unbeknownst to many women, Boostceuticals ALCAR plays a great role in energy generation, specifically involving fat metabolism that makes it a sensible fat burner. Boostceuticals ALCAR will burn in specific the visceral fat which is the problem belly fat. This action inhibits the production of triglycerides and consequently for women to develop atherosclerosis. Interestingly, Boostceuticals Acetyl-L-Carnitine supplement contains the most effective pure fat burning source for natural energy and the best possible results to match every woman’s hard effort. Because Acetyl-L-Carnitine naturally occurs in the body, it is easily recognized by the body and used optimally by the body. For more details on this quality Boostceuticals ALCAR Acetyl–L-Carnitine, be sure to visit https://boostceuticalsnutrition.com/international-women-month and take advantage of a 30% OFF Amazon discount coupon code - available for all readers. This is part of their initiative to empower the women and fulfills their multiple roles in our society. Boostceuticals is dedicated to supporting people on their pursuit of health and wellness. With the right blend of nature and science, all Boostceuticals supplements are manufactured to the highest-quality standards in the USA in an FDA certified facility adhering to all GMP requirements.Every step is taken to ensure the development of superior and fine quality nutritional supplements. With its use of natural ingredients and being GMO free and gluten free, it has become the sensible and healthier choice for every American household.